EA's financial results show that despite sluggish sales of PCs, revenue from PC gaming rose by 8 percent compared to the same quarter last year. Full details at The Tech Report. 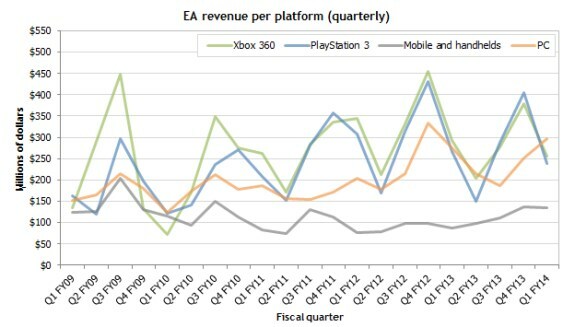 The graph should be self-explanatory; it shows EA's net quarterly revenue over the past five years for each major gaming platform. As you can see, console numbers are subject to kind of a see-saw pattern, and PC figures have their ups and downs, too. Still, it's clear that EA's PC gaming business is growing. Also, especially over the past couple of years, EA's PC revenue looks very respectable compared to what the company makes from the Xbox 360 and PlayStation 3.